Opening with an orchestral flourish, the new EP from New York-based Imperial Triumphant lives up to both parts of the band's name! Consisting of two six-minute songs, titled Sodom and Gomorrah, the theme here is that of utter destruction, and the music reflects that well. The opener sets the scene, moving from deep growls to Deathspell Omega-esque squalling riffs and technical metal somewhere between black and death, the band make a good impression very quickly. Atmospherically adept as well as instrumentally, the track devolves into an eerie collage of sounds, abstract drums and guitar riffs working alongside each other yet not together as one. Gomorrah changes that with an almost catchy opening – still very technical, it's much more groovy and instantaneous than the ending of the previous track. Dying away and then restarting as a sort of fast tech-death take on early Morbid Angel, it's a step away from the black metal that I was expecting, although doesn't completely lose the Deathspell-ish dissonant thrill. Instead, it keeps it to a hint in the guitars, a hint that grows until it overwhelms again, ending on a furious blast in keeping with the war metal expected from that band name, although it's far classier. 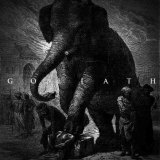 Focusing on the odder aspects of Imperial Triumphant's sound, Goliath is a good showcase and certainly enough incentive to check out the band's only full-length to date, 2012's Abominamentvm.